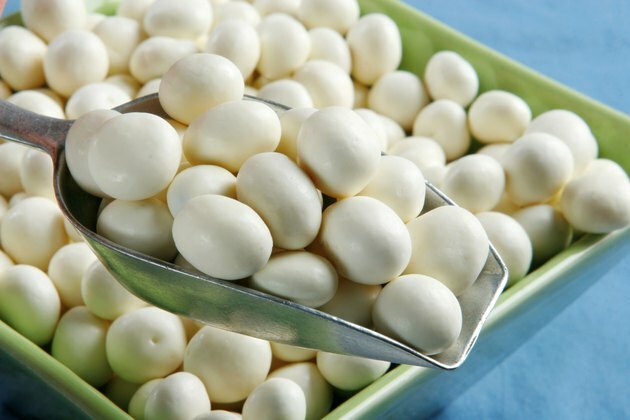 Yogurt-covered raisins are a fun snack food that most children enjoy. But Dr. Dina R. Rose notes that most recipes call for the addition of fats and sugars, reducing the treat's nutritional value. According to LIVESTRONG's DailyPlate, a 1/3 cup serving of yogurt-covered raisins from Publix grocery store contains 190 calories, 7 g of fat, and 20 g of sugar. Although you can purchase ready-made yogurt-covered raisins in most grocery stores, you can also prepare this tasty treat at home. Place cheesecloth as a liner in the colander. Place yogurt in the colander on top of the cheesecloth and set the colander on the bowl. Cover both with plastic wrap and allow it to sit overnight. Hold the cheesecloth and gently squeeze the rest of the moisture from the yogurt cream cheese. Empty the bowl, and then put it back under the colander. Let stand for 8 hours more before removing the yogurt cream cheese. Boil a pot of water with the steamer basket in place. Place raisins in the steamer basket so that they do not touch the water. Steam the raisins for 5 minutes with the steamer basket covered. Combine the butter and yogurt cream cheese in the saucepan. Continue stirring over low heat until the cheese and butter are soft and well mixed. Empty the contents of the saucepan into the large bowl. Slowly add confectioners' sugar until the frosting mixture is thick and creamy. Stir in vanilla extract and raisins. Spoon the coated raisins in teaspoonful clusters onto wax paper and allow to sit uncovered overnight. This recipe will yield four dozen clusters of yogurt-covered raisins. The same yogurt frosting recipe can be used to coat pretzels and dried fruits. Yogurt-covered raisins contain more sugar and fat than plain raisins and should be eaten in moderation. A healthy alternative to yogurt-covered raisins is low-fat vanilla yogurt combined with natural raisins.